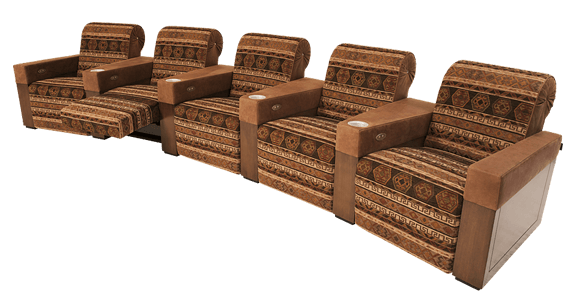 Seats from the extensive Cineak collection of high-quality home theater seats can be found in most of the top home cinemas throughout the world. 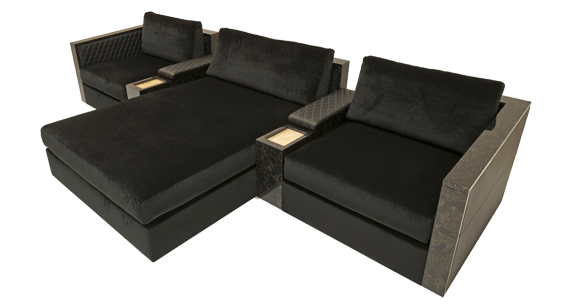 Each seating model encompasses the ultimate in design, the finest quality and materials, luxurious options, numerous customizations and ultimate comfort. The NERO seat features the same design, comfort and luxury characteristics as the FORTUNY but with fully upholstered armrests. 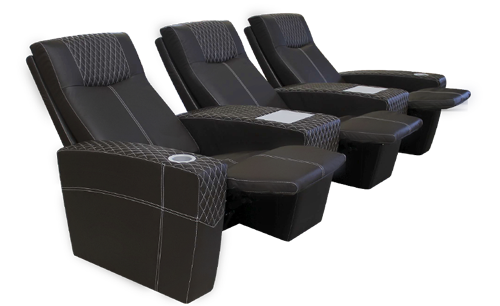 Available with a single motor, dual-motor or manual recline mechanism and a manual or motorized articulating headrest. The Grafton club chair presents a new interpretation of a club chair design, combining cutting-edge technology with the ultimate in craftsmanship and luxury materials used. The chair features a motorized footrest which allows one to adjust the position of the footrest while enjoying ergonomic comfort in the seat and backrest. Most of CINEAK’s cutting-edge technology features are available on this product. The chair features a wooden design element on the armrests and back of the chair, which is available in a variety of standard wood types and colors and if needed can be customized to match any particular custom wood type/color. 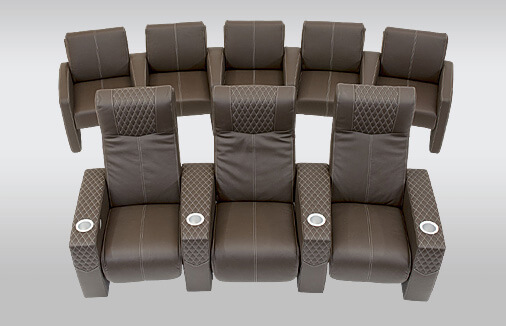 The ESCANA theater chair was created for the most luxurious home theater. It’s concept is unique in many aspects and the design combines leather upholstery, varying stitching finishes, ergonomic contours, real wood veneer and an independently controlled Dual-Motorised reclining or incline mechanism. 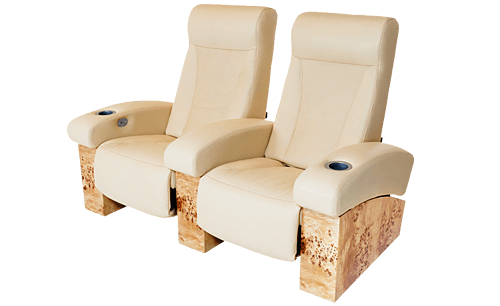 The ESCANA comes standard with a manual articulating headrest- which allows one to adjust the position of the supporting headrest when in the reclined or inclined position. The articulating headrest is also available motorised. The FERRIER brings a unique approach in applying diamond stitching patterns to a theater seat, while maintaining style and increasing comfort. 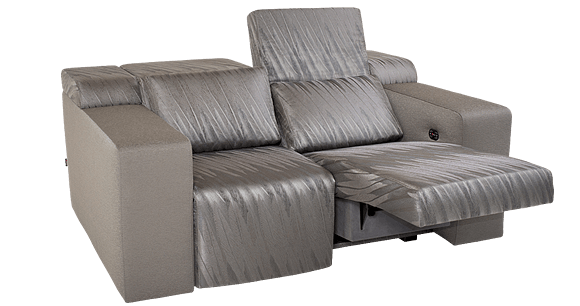 The steel recline mechanism allows for the backrest and footrest to operate independently from another. Fully articulating headrest allows for desired viewing condition and proper head and neck support. Numerous customisations are available. The Matching Ferrier Cine chair allows for combinations of layouts with a common style. STRATO plus + is a slightly modified version of the standard STRATO. The height of the headrest has been extended by 4”/10cm to offer extra head support, especially for the taller individuals. The overall depth of the back of the chair has increased by 4”/10cm and the backrest is slightly slanted, providing an elegant change in overall look of the STRATO. The D-BOX ready option is available on single and double seats! The sophisticated living-room entertainment sofa bringing together sleek, modern design with soft casual comfort along with the performance of an entertainment chair. The Gramercy features a contemporary, lush and deconstructed appearance and provides a more casual comfortable feel with a significant dash of elegance. While the design consists of sleek lines, it still represents a more comfortable experience. 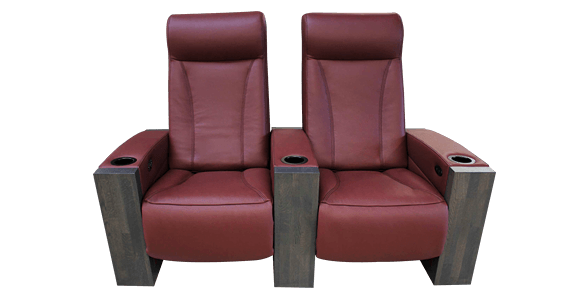 The Gramercy features a cutting-edge DUAL motorized incline mechanism which allows the user to adjust the footrest and headrest position to their preferred comfort-level. The motorised mechanism allows the Gramercy to function as a traditional sofa AND at the touch of a button turns it into a truly relaxing home-entertainment chair. 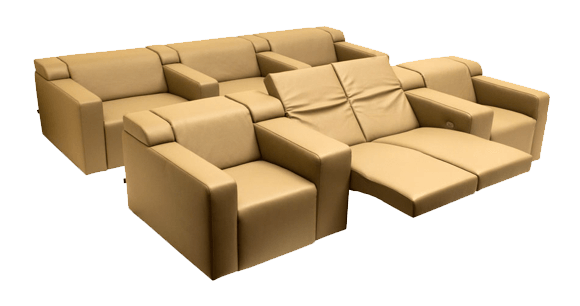 A new wave of modularly built sectional Sofa Seating. 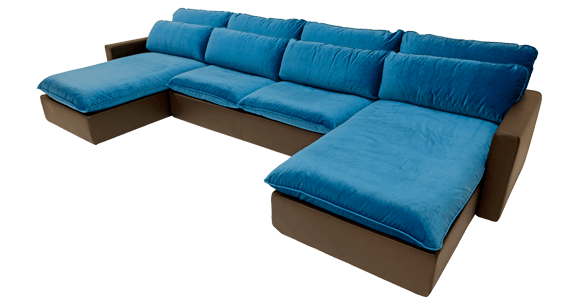 The shape of this sofa is defined by firm leather upholstery along the outside of the seats. Due to its modularity, numerous seating layouts can be created by combining elements. Diamond stitched patterns are applied to the inside of the outer arms and along parts of the middle armrests. The straight wooden parts accentuate the unique shapes of the product and are available in different finishes such as RAL painted, custom wood veneers and CINEAK’s exclusive high-gloss “tiger-eye” finish. The inner armrests feature a recessed back-lit in-lay table, which can be used to place drinks, snacks, touch panels, etc. The inlay table is available in frosted glass and in Carrera or Crema Valentia marble.The highly comfortable cushions consist of a mix of foam flakes and down feathers. The “DITO club” chair adds charm to a room décor and will bring history into your home. The “DITO club” chair is inspired by 19th Century English chairs found in clubs where members engaged in deep philosophical conversations with like-minded folks. The “DITO club” chair presents a personal getaway for engaging with guests, reading a book, relaxing or enjoying your favorite show or movie. With the “DITO club” CINEAK brings back the classic seat arrangements found in private screening rooms of the 1930s. 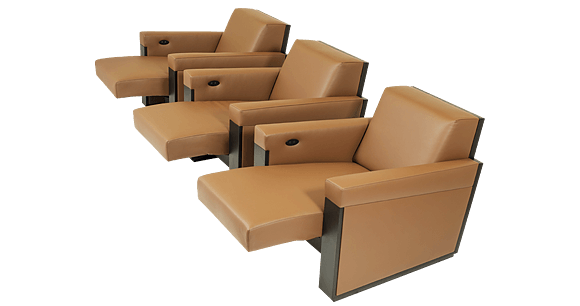 The F-Cine is a club chair that can be used in private cinemas, media rooms, living rooms and auditoriums. The chair features a slim design and its compact nature allows one to put this chair in areas where space, such as riser depth and width, are of concern. The chair can be configured in row configurations utilizing straight, curved or double wide armrests. Custom requests for backrest height, armrests width, etc. are available. 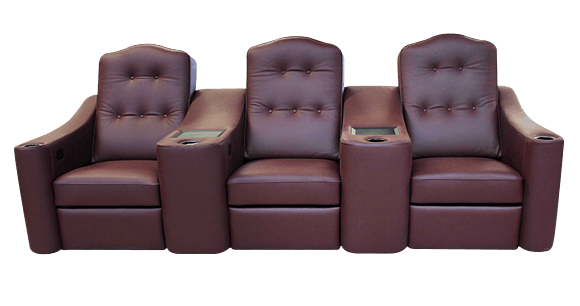 to revolutionise the Home Cinema seating market due to its comfort, luxurious presence and quality craftsmanship. We are proud to offer the “luxury edition” version, which presents an even more exclusive selection of exotic and luxurious materials and finishes. The “luxury edition” offers an exclusive selection of exotic wood veneers, the combination of superior leathers with Alcantara® on particular parts of the chair, and discrete contrast stitching. All the produced chairs are marked with a “luxury edition” tag to identify the uniqueness of the product. 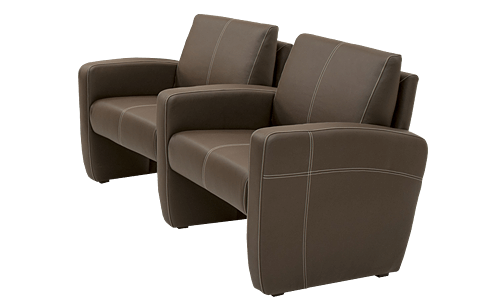 Both the recliner and incliner versions of the FORTUNY are available in the “luxury edition” version.